As great as Flexbox is when it comes to aligning items on the page, one issue I have always had is that the Flexbox style options need to be repeated quite a few times and don't feel very DRY. I'm setting a full list of variables that could potential be used for this flexbox implementation and I'm setting all of them to false by default. Inside of the mixin I always have the 'display: flex' rule set since that is needed for each time that the mixin is included. Then I check to see if each variable is not false (this means that the variable was used). If so, I set the style rule to the value passed in as the argument. 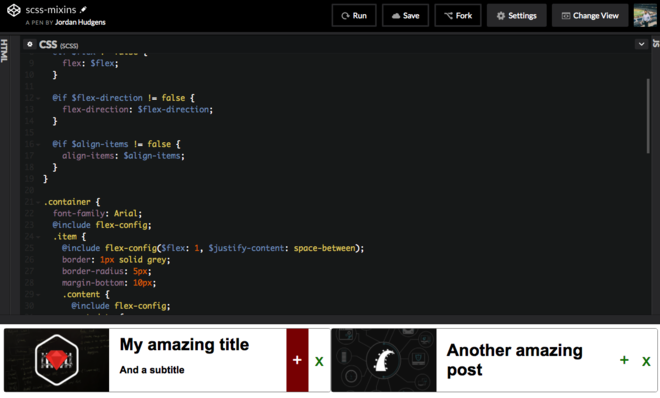 From there I simply include the mixin in each place where the old flexbox code was. For the locations where only the 'display' rule was called I can call the mixin with no arguments. In the locations that had a set of rules, such as align-items or flex-direction, I pass in the values with named arguments. And that's it. Not only is this container class cleaned up, but not I can call this mixin from anywhere else in the application that uses flexbox.